Use Do Not Touch Tags to prevent accidental machinery startup and protect workers conducting repairs and maintenance. Provide on-the-spot warning for potentially dangerous conditions, alerting workers to hazards until the problem is fixed and the danger is safely averted. 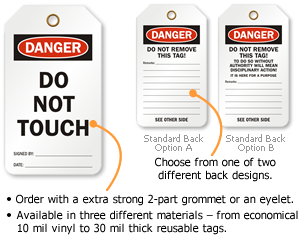 • We use a 2-part grommet or eyelet which has been rigorously tested to support 50lbs for our 15 mil Vinyl Tags, and 70lbs for our 30 mil Sealed Plastic Tags. • Tags are resistant to water, tearing, fading, abrasion, and much more depending on the material selected.